Its been a great year for 20 mph up and down the country. Lots of examples of towns starting to adopt 20 mph limits and great results from those who have already implemented them. Report after report from learned organisations has come out in favour of 20 mph limits. Here are the one I am aware of. Apologies if I have missed some. In many instances you can find more information on the 20s plenty website. Fewer road collisions are happening in Brighton & Hove streets where 20mph limits have been introduced. Meanwhile the majority of residents consulted about extending the limits to new areas of the city supported the idea. The council has monitored collisions and casualties from the Phase 1 area of 20mph limits, in central Brighton & Hove, introduced in April 2013. The figures are lower than the three-year average for the area. There was a 17 per cent drop in collisions. The average was 318 collisions a year, whereas under 20mph the figure went down to 264. The average number of casualties was 371 per year from 2010-2013. With the introduction of a 20mph speed limit it dropped to 327 – a reduction of 12 per cent. There was a 20 per cent reduction in serious casualties, down from an average of 53 to 43. Following a visit to the village of Atherington in September members of the North Devon Highways And Traffic Orders Committee at their meeing on Tuesday 18th of November approved the Safer Atherington Streets group application for a 20mph speed limit. This decision was reached on the basis of a lengthy and detailed application document, support form local groups, schools residents and firms and the fact finding visit, despite advice from Highways staff - they stuck with policy all along. The next step is for the decision to go before DCC Cabinet possibly in January 15 because there has to be an exception made. Finance is a matter of concern but Atherington Parish Council has already obtained pledges of over £1,000 towards implementation costs and this was made clear to HATOC. Average speeds are down, more people are choosing to walk or cycle rather than drive and there are fewer road injuries, a year after the city's first 20mph speed limit area was introduced in Sherwood. Surveys of the scheme show there has been a 5.2% decrease in average speeds to 21.1mph from 22.3. The reduction in high speeds in the area is also positive, with 85% of drivers recorded as travelling at or below 27.9mph - a high speed reduction of 11.5%. On the Sherwood roads that are now part of the 20mph scheme, there have been on average 9.4 casualties per year in the five years before the speed restrictions were introduced. In the 12 months following the introduction of the 20mph speed limit, casualties have reduced to eight; all of them were slight injuries only. The Royal College of Paediatrics and Child Health recently publisged its manifesto for Making the UK’s child health outcomes comparable to the best in the world. Amongst the recommendations was a call to reduce the national speed limit in built up areas to 20mph to reduce the number of deaths by road traffic accidents. 20's Plenty for Us and Vision 2020 calls for 20mph limits to help people to see and be seen on roads- Oct 2014The 20’s Plenty for Us campaign, supported by VISION 2020 UK, is calling for a 20mph default speed limit in residential streets without physical calming in order to protect vulnerable road users, including those who are blind and partially-sighted. Edinburgh's 20mph Limit Trial A Resounding Success - Sep 2014Edinburgh’s 20mph limit trial showed improved popularity, perceptions of safety and cycling and walking levels. Cycling to school trebled. Parental permission for outside play doubled. Speeds and car use fell. Proposals extend the benefits citywide. Bogus analysis of DfT casualty figures by Institute of Advanced Motorists July 2014 IAM analysis of DfT casualty figures for 2013 show that as the total number of 20mph roads increases, so do the total number of casualties, but their conclusion that this is evidence of increased danger shows a woeful lack of understanding of statistics. Capitals Are Going 20mph - Jun 2014British capital cities are embracing wide 20mph speed limits. Lewisham will soon join nine other London Boroughs at 20mph. Edinburgh's plans for 20mph cover high streets and residential roads. Cardiff’s 20mph pilot has been installed. The streets of Paris will soon be almost entirely 30kmh (18mph). Calderdale Embraces 20mph - Apr 2014Calderdale is the first West Yorkshire Council set to approve a wide area Total 20mph limit residential road policy. Key is a commitment of £500k of public health funds for engagement and persuading drivers of the advantages of slower speeds. 20mph for 50% of London's Roads for Pedestrian Safety - Apr 2014Two major pedestrian safety reports have underscored the vital role 20mph limits play to protect pedestrians from road danger. The Greater London Assembly Transport Committee wants half of London’s roads to go 20mph by 2016. YouGov poll shows that Britons want 20mph limits - Jan 14 Academics at UWE Bristol’s Social Marketing Centre have analysed a YouGov survey and concluded that, whilst most Britons want and intend to abide by 20mph limits for residential and busy streets, they see the need for enforcement. 20mph Limits: Best Public Health & Equalities Policy Option says Social Science Expert Prof. Danny Dorling - Jan 2014The British Academy have a published a policy advice collection in which Prof Danny Dorling clearly lays out the evidence for wide 20mph limits as his top policy to tackle health inequalities. Entitled “If you could do one thing..” it is a guide for Local Authorities by nine leading Social Science academics. I will use the rest of this post to update on Leicestershire progress - a much shorter blog...! In November 2013 County Councillor David Snartt spoke at the Environment and Transport Overview and Scrutiny Committee making the case that the Council should be reviewing their speed limit policy in the light of DfT guidance issued early in 2013. The points were well made but the response from the Highways official was dismissive, inaccurate and incomplete. I had expected that the Scrutiny Committee would ask some probing and challenging questions and that there would be some debate. Alas no they accepted what the officer said at face value and quickly moved on with no apparent decision or outcome. We have basically then spent the last year trying to get them to review the "decision" not to hold a scrutiny review, enlisting the help of David Snartt and my own county councillor Ivan Ould. We had been promised a meeting with the member for Highways Peter Osborne but this meeting never seemed to get arranged or was cancelled. Finally we were told in October 2014 that we did not need to meet with Peter Osborne and that the matter would be referred to Scrutiny. David Snartt wrote to the (new) chair of the Scrutiny Committee on 20th October. We have heard nothing since despite chasing. to involve itself with external organisations operating in the County to ensure that the interests of local people are enhanced by collaborative working. There is evidence that other local authorities have formally revised their speed limit policies (or are in the process of doing so) and have consulted tyhe public on these policies. Here is an example in Hertfordshire . We are raising the issue of speed limit policy with the Leicestershire County Council with the Environment and Transport Overview and Scrutiny Committee which covers this function. We are joining forces with Woodhouse Eaves who also want to implement 20mph limits. Their local County Councillor has agreed to raise the issue on our behalf. In the same month that saw high profile commitments to 20 mph in the City of London and our second city Birmingham, Stoke Golding Parish Council unanimously reject 20 mph limits. 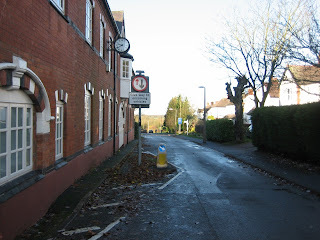 "The Parish Council discussed again the issue of a 20MPH speed limit and confirms that in their unanimous opinion that whilst safe streets are a priority and desirable, it would be misleading/pointless to give their opinion on a 20MPH zone when the present austerity cuts at County render it undeliverable, coupled with a lack of enforcement by police”. This comes after protracted discussions with the Parish Council following a significant random survey of the village in late 2012. With 76% of respondents identifying speed as an issue and 67% supporting a village wide 20mph speed limit (only 22% opposed), we not unreasonably expected the Parish Council to support the majority view. We had always anticipated problems with a Local Authority that is short of cash and which has failed to revise its speed limit strategy following new government guidance on speed limits issued earlier this year. We have looked at the historic accident data for Stoke Golding and the forecast savings from speed reductions should pay the modest amount for a 20 mph sign only scheme within a year. We also recognise that enforcement is a challenge which is why we are pleased that the Association of Chief Police Officers earlier this month updated its guidance on enforcement of speed limits. This sees the enforcement of 20 mph limits taken much more seriously with tougher penalties for those who wilfully offend. The change to 20 mph limits where people live is a movement, and it will take time to normalise this behaviour. It is not anti motorist - it actually has minimal impact on journey times. It is about a more equitable sharing of the public space where people live, socialise and travel. Towns and cities are getting the message in a big way with local authorities covering more than 11 million residents having now committed to 20 mph limits. Over the last several months there have been significant announcements of widespread implementation in Birmingham, London (City and many boroughs), Oxford, Liverpool, Manchester, Leicester and Brighton, to name but a few. These will join pioneering cities such as Portsmouth, Bristol and Hull who are now reaping the benefits in terms of lower accidents rates and increased walking and cycling. One day people will look back and say "surely we didn't used to let cars travel at 30 mph were people live" in the same way that we now say "surely we didn't used to let people smoke in public places". So nationally the picture is very upbeat and we are quite convinced that the implementation of 20 mph limits is no longer "IF" but "WHEN". We have talked to several other villages around the country and a 3 to 5 year campaign is not uncommon, but success has been achieved. We are therefore planning to join forces with other like minded groups in Leicestershire to try and influence county policy and consider how best to continue locally. The Association of Chief Police Officerts (ACPO) has revised its speed enforcement policy guidelines to reflect a tougher approach to enforcing 20 mph limits. The new guidance recommends that at speeds between 24-31mph a driver should be offered the option of attending a speed awareness course or a fixed penalty notice fine. At speeds of 35mph plus a summons will be issued. Chief Constable Suzette Davenport, ACPO national policing lead on roads policing, said: “Speeding remains an issue of high concern, particularly in residential areas or near facilities for young or vulnerable people." This is welcome news. In the past the ACPO have been criticised for their failure to enforce 20 mph speed limits. I am still concerned about the frequent statements of "self enforcing". Yes in an ideal world roads would be designed so that vehicles can only travel at a safe speed, but unfortunately many of our roads are just not like that. At the end of the day the motorist has to accept that a limit is a limit and must be obeyed. I hope this is part of a movement to take speed limits seriously in the UK. Currently limits are not observed by a significant number of motorists and that is because they are not enforced. I recently had a visitor from Australia staying with us and whilst out they observed "don't a lot of people speed in England". I have driven in Australia and almost everyone obeys the speed limit. Why?, because it is enforced and because it is regarded as socially unacceptable. The 2012 British Social Attitudes Survey results have just been published. The results show 72% in favour of 20 mph limits with just 11% against. Women favour 20 mph speed limits more at 76% then men at 68%. The full report can be found here https://www.gov.uk/government/uploads/system/uploads/attachment_data/file/209890/bsa-2012.pdf. 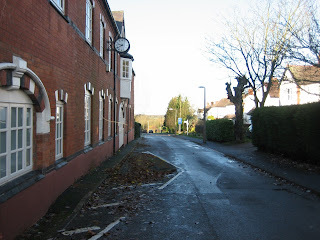 Page 21 also shows peoples attitudes to speed bumps and closing residential streets. Station Road in Stoke Golding is within the Conservation Area established in 2004. The view down Station Road past the old factory is noted as a "view to be protected". Unfortunately this view is has been spoilt by a rather ugly chicane. I don't think its the chicane that the problem rather its the signage which is rather over the top and shouts "highway" rather than "street". I would like to see a design which is more in keeping with the character of the conservation area. Maybe a nice planter perhaps with some reflectors. I have airbrushed out the signage on the second photo - doesn't it look better? A review of the conservation area is ongoing. I have discussed the chicane with the council conservation area Barry Whirrity who has taken some photos and says he will talk with Highways. Stoke Golding is a lovely village in South West Leicestershire. We have a vision of people centered streets. A place which is attractive, where young and old feel safe. Where drivers behave responsibly and where people are happy to walk and cycle. 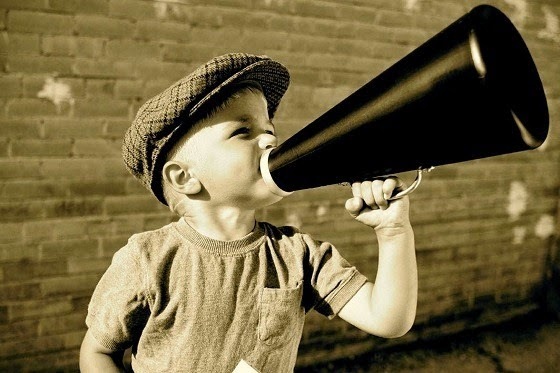 We want our streets to be alive - a vibrant place where people live, play and socialise. This blog is dedicated to our efforts to achieve our vision.